Golf lovers celebrate the sport in every season, but August is an especially noteworthy period — it’s National Golf Month! Do you have plans to partake in the action? Golf originated during the 15th century in Scotland, but it remains popular far and wide — especially in the Daytona Beach area. One reason golfers flock here from all over the world is due to the area’s subtropical climate and pleasant conditions for the sport. 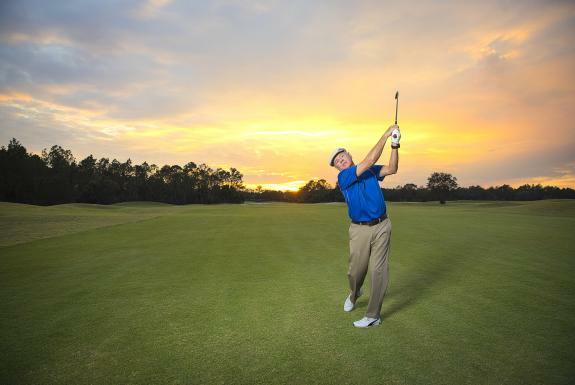 Of course, year-round sunshine makes any season a great time for golf in Daytona Beach, but it’s an especially ideal place to take a swing at National Golf Month. Gather some buddies and head to Daytona Beach to hit the links! Going for an early morning round here is perfect because you can beat the August heat and get your fill of the fairways, and then relax on the beach for the rest of the afternoon. If you are already in the region or if you are just looking for an excuse to make a quick getaway to the sunshine, getting to Daytona Beach and booking last-minute accommodations is a breeze. Conveniently located at the junction of I-4 and I-95, Daytona Beach is a straight shot from nearly any direction. Plus, Daytona International Airport is serviced by major airlines such as Delta and American Airlines. Daytona Beach’s close proximity to Orlando and Central Florida attractions makes it an easy two-day escape, long weekend or full-fledged, week-long vacation. Easily get an oceanfront hotel room or condo for your crew. DaytonaBeach.Golf offers unrivaled rates and discounted stay-and-play golf packages — explore all current offers today! Discover outstanding courses that offer challenges for every skill level. Daytona Beach features a wide array of beautiful courses that offer unique layouts and natural beauty. The destination is so widely celebrated that Golf Digest ranked Daytona Beach in the nation’s top 15 places to play. Go where the pros play! This golf club adheres to a superior standard of excellence, and proudly delivers challenging courses, immaculate conditions and high-quality service. LPGA International offers two courses that are distinctly different but each outstanding in their own right. The Hills and the Jones, named for their respective designers, are both courses named to Golf Magazine’s list of top 10 courses to play. LPGA International is home to the Ladies Professional Golf Association, and is loved by tour players and golf amateurs alike. With expertly crafted sand bunkers, natural marsh area, wetlands and strategic water hazards, both courses pose an interesting challenge to golfers. For a bit more of a casual environment, head to the Riviera Country Club, which has a longstanding reputation as “The Friendly Club.” Since 1953, Riviera Country Club has welcomed golfers to its Ormond Beach location with sincere hospitality and flexible course accommodations. Unlike many other courses in the area, no tee time is required here — an ideal choice for friends coming to the area for a golf trip on a whim. This par-71 championship course also offers a driving range, as well as a chipping and putting practice area. This classic golf club has been serving the Daytona Beach area since 1921 and is a favorite of dedicated players. Here, you can expect to find complete practice facilities, which feature a 10,000-foot putting green, a new, lighted driving range and much more. As for the actual course, you won’t be disappointed. The designer, Donald Ross, envisioned and executed the original 18 holes of the South Course, which is considered less challenging of the two. The North Course, on the other hand, is a demanding Slim Deathridge creation redesigned by Lloyd Clifton in 1997. The course delivers an interesting combination of forgiving tee shots and challenging approaches, making for a unique and memorable game. Of course, the clubs listed above are just a small sampling of the available options in the Daytona Beach area. What are you waiting for? The Florida sunshine is beckoning you to come play. Explore the full line-up of courses and packages today! Enjoy a look at everything Daytona Beach has to offer and download our free official visitors guide, golf guide or sign up for our e-newsletter.